The AMBIENT OZONE BLOWER AOB 930 can supply filtered ambient air with an ozone content of up to 1000 ppbv at the high flow rate of 30 liters per minute. At 15 liters per minute it can deliver an ozone concentration of even 2000 ppbv. The ozonized air is blown out of sort of a shower head. 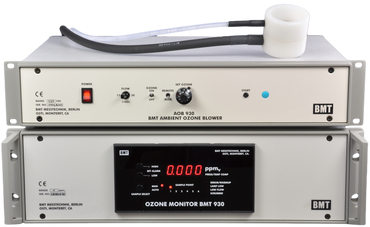 The actual ozone concentration can be precisely measured and/or automatically controlled by an OZONE MONITOR BMT 930 or BMT 932 connected to the AOB 930. The air flow rate can be selected to 15 l/min or 30 l/min by a front panel switch. The ozone content can be set via a 10-turn potentiometer between zero and about 1000 ppbv (at 30 l/min) or 2000 ppbv (at 15 l/min). Part of the ozonized air (1 l/min) is sampled directly at the outlet of the shower head, and is fed to the AMBIENT OZONE MONITOR BMT 930 or BMT 932 for precision measurement. When the AOB 930 shall be used as a cotrollable source of ozonized air, and ultimate precision now is not required, it can be used without an OZONE MONITOR BMT 930 or BMT 932. The ozone content of the ozonized air now depends on the properties of the air (humidity, temperature, pollutants). With usual indoor air quality the ozone content will correspond to the potentiometer setting with an uncertainty of about 5%. The AMBIENT OZONE BLOWER AOB 930 is available for rent either with or without an AMBIENT OZONE MONITOR BMT 932. For further details please contact factory.